Heading back West out of Arizona we decide to spend a few days in the Mojave National Preserve. 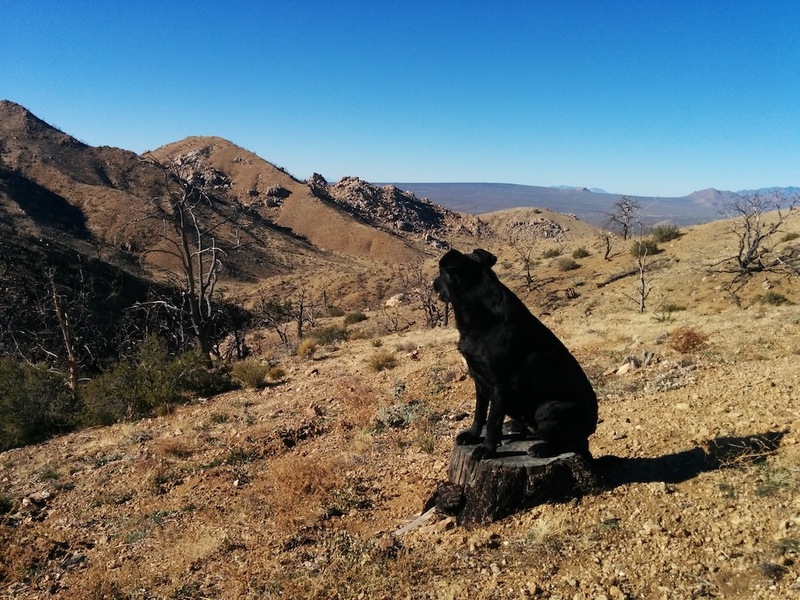 We’re expecting to find some stunning views and fun exploration while wandering about the third largest unit of the National Park System in the contiguous United States. 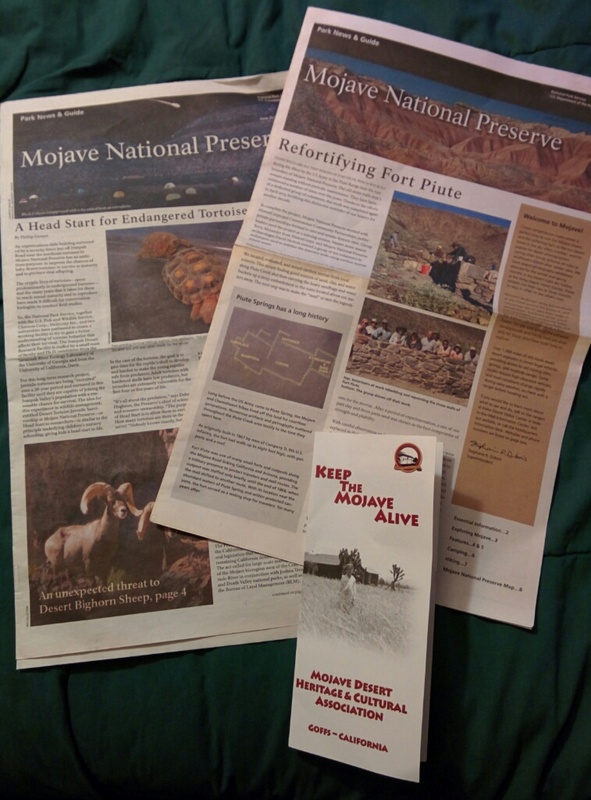 After a quick stop at the little Hole-In-The-Wall Information Center (actual name) to ask a few questions, pick up some info pamphlets and top off our Scepter water cans we headed back out onto the unpaved part of Black Canyon Road and into the desert in search of adventure. 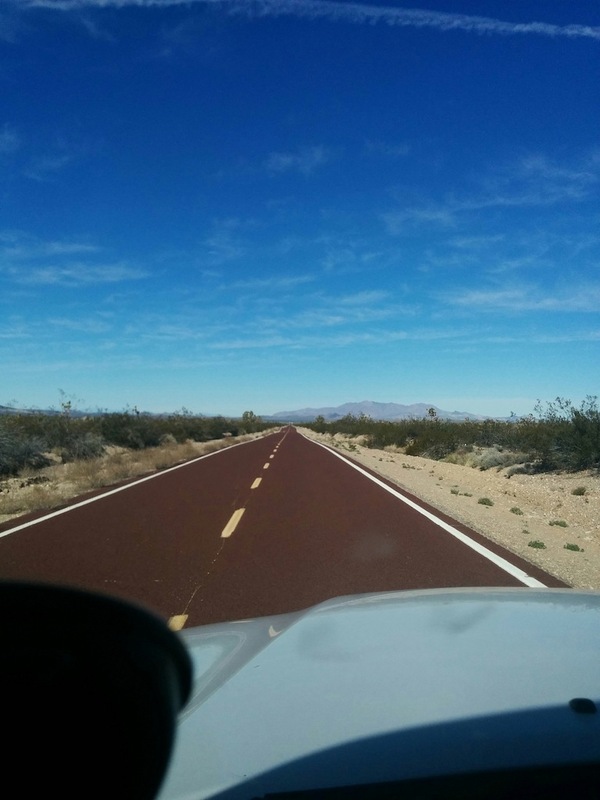 With both sides of the road peppered with Joshua Trees it is an eerie yet scenic landscape. I joked to myself and Willow that it looked like something you would see as a stand-in for a strange, alien planet on the original Star Trek. We’ve aired down our tires and are having a smoother ride as we turn onto a side road to see what the Mid-Hills campsite is like. It’s beautiful but stark. We would stay for a night but the other presence in the campground is a family with young children and all their tricycles and toys seemingly setup for the long haul and staying for the entire 14 day limit. Not our scene so we head back out to look for another option. 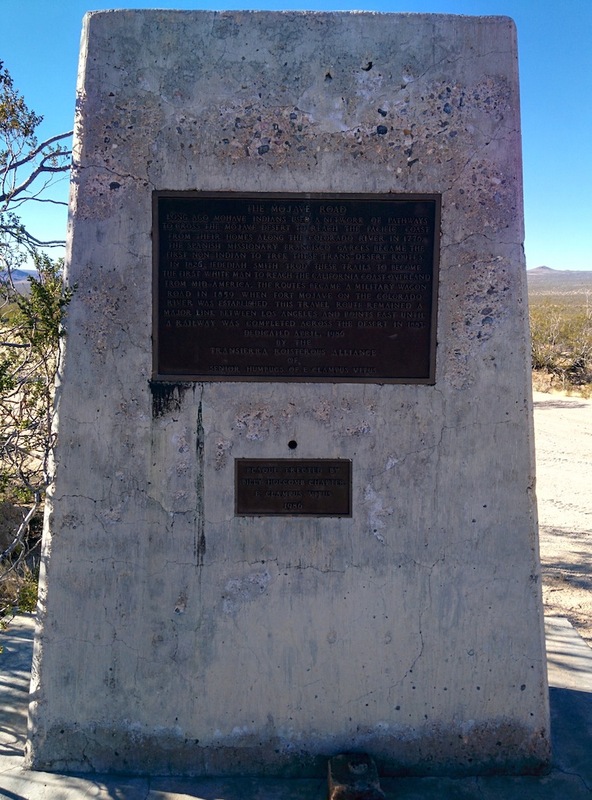 Once we were inside the expanse of the Mojave National Preserve one of the sights we wanted to see as well as pay our respects at was the Mojave Cross. We also know that there are camping options in that area so we’ll head that way and see what we see. Turning off of Black Canyon Road onto Cedar Canyon Road we continue on nicely maintained dirt roads until we come to a section paved in red. 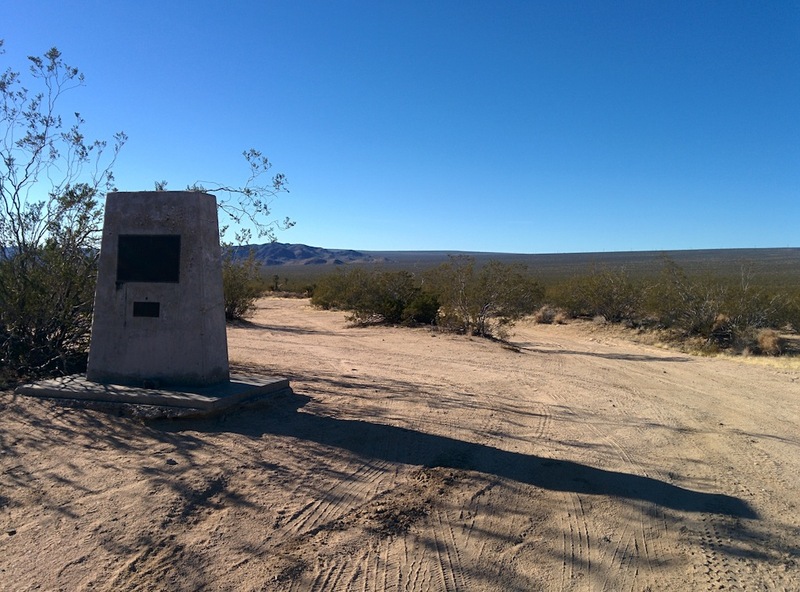 Our online maps tell us we are close to Kelso Cima Road which is where we will turn right and head towards the Mojave Cross site. At the intersection we cross over a set of railroad tracks and pull to the side of the road to begin the airing up process. This is before (and a reason why) we purchased the awesome MV50 compressor and so I am expecting at least 35+ minutes waiting to fill up all four tires. That’s the standard procedure: hook old compressor up to a tire, turn it on and mess around checking the undercarriage of the truck, seeing if anything shifted in the shell, possibly letting Willow out to stretch her legs and have a drink and checking on the glacially slow progress every couple of minutes or so. When one tire is done then start that process on another and so on. 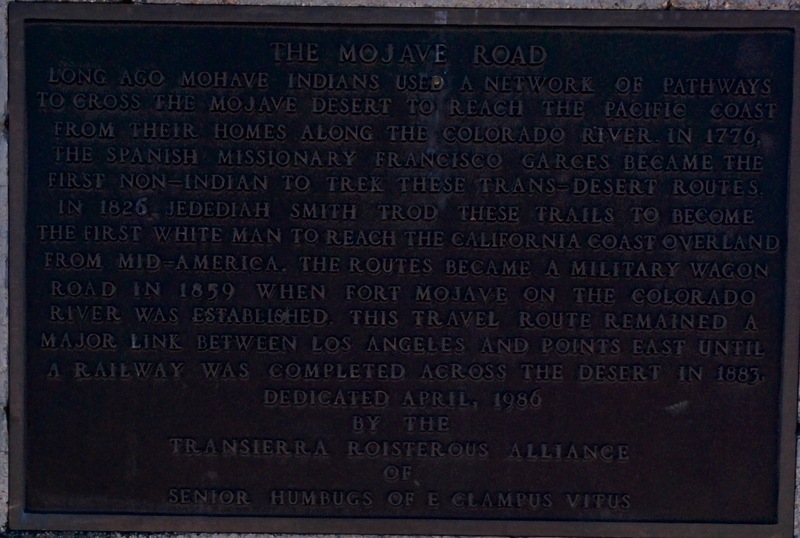 While waiting for one tire I look across Kelso Cima Road and see a marker with a plaque on it and jog across the road to see what it is for. 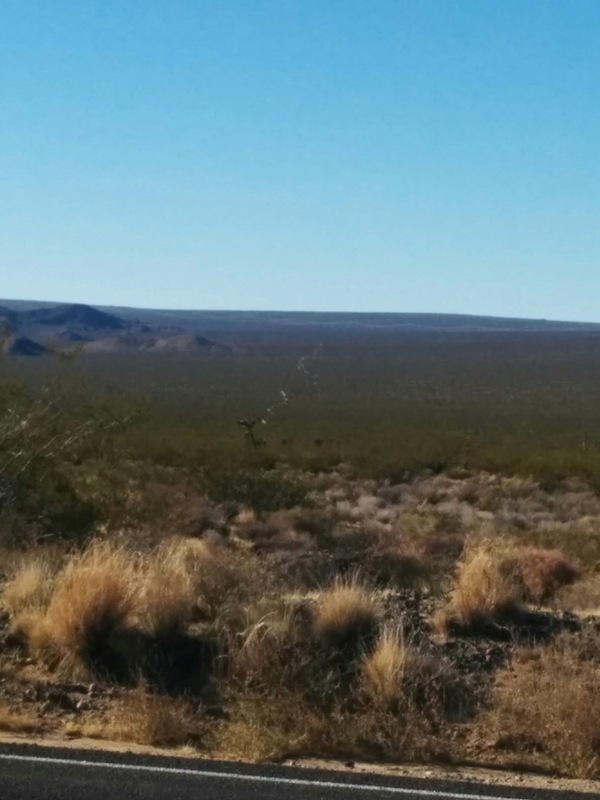 …and farther in the distance the small ribbon of the Mojave Road itself cutting through the wilds of the Mojave Preserve. Since we are on a schedule to get to the Mojave Cross and our camping spot for the night and this is also a kind of shake down test run of the Tacoma setup as it now sits we decide to forego that route and promise ourselves we will do more research on it and come back to explore it next time we are in the area…which will probably be in January 2016. 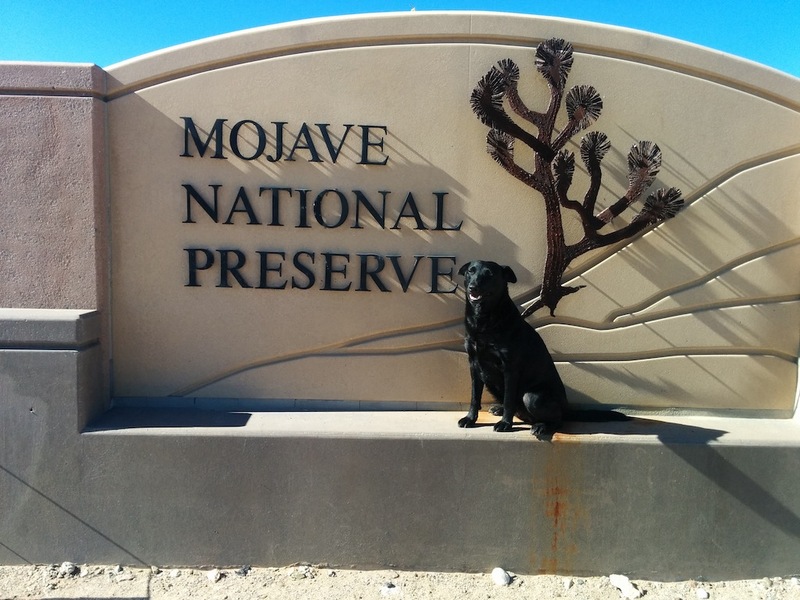 The Mojave National Preserve, like many stunning National Parks and larger public lands, cannot possibly be seen completely in just a day or two. We did our best to travel the length and breadth of the preserve to get a good initial impression of the area and what it has to offer so that, on our return trip, we can focus on those areas we find the most intriguing. We will certainly post another report and more pictures when that happens sometime in 2016. Stay tuned.